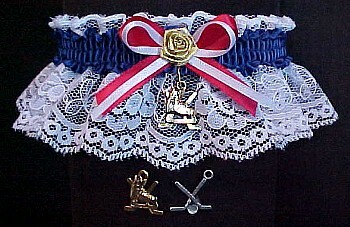 Custom Themed Nautical Garters have your choice of a Sailboat or Dolphins charm attached. 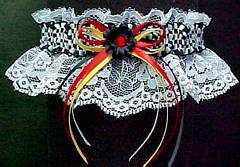 Hockey Garters in your team colors with your choice of Hockey Skates Charm or Hockey Stick & Puck Charm attached to the Garter. Fancy Bands™ The Custom Themed Auto Race Car Garters have a checkered flag band and a triple bow with your NASCAR racing colors or team colors. The Custom Themed Bowling Garters with black and white Swiss dot band and bow, bowling ball and bowling pin are accented with Marabou feathers for the bowler. 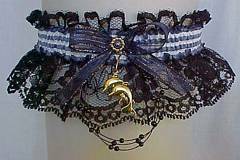 Hockey Garters in your favorite colors with your choice of Hockey Skates Charm or Hockey Stick and Puck Charm attached to the Garter.